A sweet basket of plants to warm their heart. We'll tuck an assortment of plants inside a wicker basket and deliver it straight to their door. Plants may include varieties such as ivy, Kalanchoe, or Azalea (variety is dependent upon location and availability). A gift that is appropriate for every occasion and shows just how much you care. Designer's Choice of Assorted Lush Plants. Arrives in a stylish basket planter with fresh water, ready to be displayed. During checkout, please be sure to indicate your preferred occasion when you choose a gift card. Exact plant and basket may vary depending upon location and availability. From the Garden is a hand delivered gift. These gifts are delivered by one of our local design centers located throughout the United States and Canada. Same day delivery is available for most gifts when ordered before the cutoff time. The cutoff time for From the Garden is 2 PM in the recipient's time zone. They called as soon as they got the arrangement she could not say enough about how beautiful it was and when i saw it I was so impressed - delivery was so fast .i have found my florist. Very pleased with the presentation. The person that assisted me the day I ordered From the Garden, was extremely helpful, courteous, professional and very pleasant. The From the Garden was lovely. Sent this as a gift for a dear friend. While I didn't see it in person she sent me a picture. The selection of plants was above what I anticipated. It was beautiful and they accommodated my delivery request to the minute!! Not my first gift tree purchase and will certainly not be my last. My friend said it was really pretty. Thanks for doing such a wonderful job as one never knows when one orders on line. I will always use your Business. Thanks again. The arrangement was delivered as promised, and while the flowers and plants were slightly different (as it was advertised might be the case), it was a beautiful basket. My daughter sent me a picture of the one received and it was lovely. I received excellent service, and beautiful arrangement was perfect and very well-received. Ordering and delivery were flawless! I didn't know what to expect by ordering online but I was very impressed when I saw it at the church. Thank you for making such a beautiful plant arrangement. I will keep your shop in mind for future orders. I ordered this arrangement for a sympathy gift. When my friend received the gift it was only an arrangement of flowers, which is not what I had ordered. I immediately informed the company. They said they were very sorry for the mix up and they would look into the situation. Within minutes, the representative informed me that the correct item would be delivered the next day. As promised, my friend received the correct arrangement and it was beautiful. I was very happy with the customer service they provided and that they took care of the situation immediately. I would highly recommend this company and will definitely use their services in the future. Although I was unable to view the purchase, the appreciations that were returned were very sincere. The family received numerous compliments on the arrangement and the delivery timeframe was awesome. Thanks a lot. Thank you very much! My cousin loved the gift garden in the basket. Also thank you to go out of your way to call her. Keep up the good work. I'll use your service again and recommend you!! Arrangement was beautiful! It was delivered at the right time and provided a most pleasant - and surprised - reaction by the recipient. Thank you! You did a great job. Very happy with them, thank you! 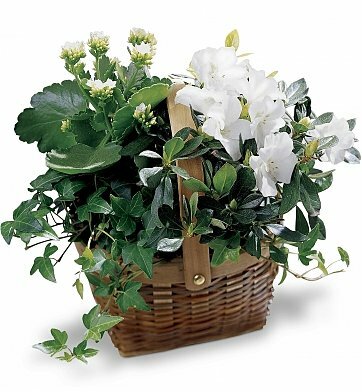 This was ordered and sent for a funeral arrangement and I was told that the plant/flower basket was very nice. This was a present for my daughter-in-law's birthday. Since the address I gave you was the wrong street number, you had to go out of your way to deliver it. You were so kind about it. I will use only your shop for anything I need. Thank you so much. She loved the plant! Thank you for delivering my mom the beautiful plant. She said it is gorgeous and perfectly done. I sent the "From the Garden" basket as a sympathy gift and the recipients really thought it was very lovely. They sent me a text with a picture of it and it looked just as beautiful as the image on the site. Extremely easy to order online and the follow up by the florist was appreciated. The prices were surprisingly reasonable. I will definitely use this company again. We got this plant for a friend that was in for surgery. His recovery was faster than expected and he left the hospital ealier than expected. The plant obviously didn't make it there in time. After a quick phone call, delivery was redirected to his house. An hour and half away. I was very impressed and will recommend them to everyone. Sent this as condolence to a family. They thought it was beautiful. GiftTree is a great company to deal with.Ii have always been very satisfied with anything i sent. If item could not be delivered as specified from vendor, GiftTree has even called to let me know before delivering order. I highly recommend From the Garden, and this company. Excellent, curteius, and prompt.